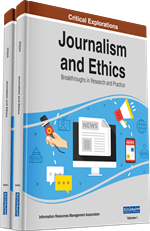 This article applied uses and gratifications to investigate motivations for posting Snapchat videos to identify whether journalistic norms inform Snapchat behavior. This study revealed that information sharing, entertainment, recognition, and self-expression motives were related to Snapchat video use; professional journalistic practices were not. Findings suggest that Snapchat video is used primarily for entertainment, rather than journalism among users. Given the robust increase by legacy news outlets in Snapchat Discover, the findings are timely and relevant. Instant messaging (IM) apps are increasingly ubiquitous in today’s world and are an increasingly salient media source for some 200 million users but also for legacy news outlets interested in reaching those users. Particularly, Snapchat has become an important feature of instant communication offering real-time exchange of images and videos between users. As of September 2016, Snapchat reached 200 million users, placing it among the most active social network sites such as Facebook (1.7 billion users) and WhatsApp (1 billion users) (Statista, 2016). In the previous year, a report by Pew Research Center announced that nearly half of smartphone owners aged between 18 and 29 use messaging apps such as WhatsApp, while 41% use apps that automatically delete sent messages such as Snapchat (Duggan, 2015). The youth orientation of Snapchat makes it an especially, and increasingly, desirable platform for legacy news outlets interested in reaching young consumers (Lichterman, 2015; Spangler, 2017). The generational disparity in traditional news consumption, which first appeared in the 1960s, continues apace, with the oldest Americans six times more likely to watch TV news, for example, as those under age 30 (Pew, 2018). Yet, the generational gap in online news consumption, including news via social media, is closing rapidly, with the Internet set to replace television as the dominant source for news (Bialik & Eva Matsa, 2017; Gottfried & Shearer, 2017; Lomas, 2017). More Americans of all ages are using social media but the youngest adults, 18 to 24, are, by far, the least likely to read newspapers or watch TV news and most likely to use Snapchat (Smith & Anderson, 2018). With this in mind, many legacy news outlets are increasing their presence in Snapchat Discover (Lichterman, 2015; Southern, 2016). Media companies including The Wall Street Journal‎, The Verge, The Huffington Post, NPR, BuzzFeed, CNN, and Mashable are now turning to Snapchat as a form of promoting their work as well as engaging and reaching more and new audiences (Lichterman, 2015). In 2015, The Verge announced that the company receives more than 700 million snaps daily and gets approximately 10,000 views from the Snapchat users (Lichterman, 2015). Recently, Snapchat decided to bring two more media partners, Entertainment Weekly and Essence, to its Discover service to cover topics spanning entertainment, lifestyle and politics (Spangler, 2017). Today, video is not only the dominant type of media in terms of content generation and sharing, but also one of the fastest-growing components to the Internet (Molla, 2017). News media organizations are adopting non-professional journalism practices and are encouraging the audiences to share their work, such as videos, through social media to incorporate user-generated content in their news presentation and dissemination processes (Mitchelstein and Boczkowski, 2009).